Dabbagh, M., Taghipour, B. (2007). Investigation of Solid Dispersion Technique in Improvement of Physicochemical Characteristics of Ibuprofen Powder. Iranian Journal of Pharmaceutical Sciences, 3(2), 69-76. Mohammad Ali Dabbagh; Behzad Taghipour. "Investigation of Solid Dispersion Technique in Improvement of Physicochemical Characteristics of Ibuprofen Powder". 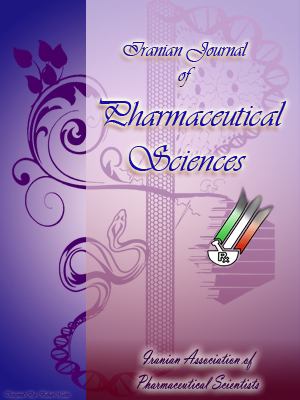 Iranian Journal of Pharmaceutical Sciences, 3, 2, 2007, 69-76. Dabbagh, M., Taghipour, B. (2007). 'Investigation of Solid Dispersion Technique in Improvement of Physicochemical Characteristics of Ibuprofen Powder', Iranian Journal of Pharmaceutical Sciences, 3(2), pp. 69-76. Dabbagh, M., Taghipour, B. Investigation of Solid Dispersion Technique in Improvement of Physicochemical Characteristics of Ibuprofen Powder. Iranian Journal of Pharmaceutical Sciences, 2007; 3(2): 69-76. Ibuprofen solid dispersions were prepared by the solvent and fusion-solvent methods using polyethylene glycol (PEG), polyvinylpyrrolidone (PVP), eudragit RS PO, eudragit RL PO and hydroxypropylmethylcellulose (HPMC) as carriers to improve physicochemical characteristics of ibuprofen. The prepared solid dispersions were evaluated for the flowability, solubility characteristics and dissolution behavior. Flowability studies of powders showed that solid dispersion technique improve flow properties compared with the physical mixtures. Solid dispersion technique found to be effective in increasing the aqueous solubility of ibuprofen. The dissolution of ibuprofen and polymers (PVP, HPMC, eudruagit and PEG-6000) were investigated using UV spectroscopy. Dissolution was carried out in phosphate buffer (pH 6.8) using a standard USP II dissolution apparatus. In vitro dissolution studies showed that in the dispersion systems containing eudragit or HPMC, dissolution of ibuprofen was retarded, which attributed to ionic interaction and gel forming, respectively. But solid dispersion containing PEG, as a carrier, gave faster dissolution rates than the physical mixtures. Finally, solid dispersion of ibuprofen:PEG 6000 prepared in 1:1.5 ratio showed excellent physicochemical characteristics and was found to be described by the zero order kinetic, and was selected as the best formulation in this study. When a drug is administered orally in a solid dosage form such as tablet or capsule, it must be released from the dosage form and dissolved in the gastrointestinal fluids before it can be absorbed. Therefore, the bioavailabil-ity of many poorly water soluble drugs is limited by their dissolution rates . Ibuprofen, a nonsteroidal anti-inflammatory drug is poorly water soluble, and its oral absorption is dissolution rate limited . Increase in dissolution of poorly soluble drugs by solid dispersion techniques presents a challenge to the formulation scientists [3-5]. The poor dissolution characteristics of relatively insoluble drugs has long been and still remains a problem to the pharmaceutical industry because the dissolution rate could be the rate limiting process in the absorption of a drug from a solid dosage form . Solid dispersion technique can be used to improve dissolution of poorly water-soluble drugs such as ibuprofen [2, 3]. Various polymers such as polyvinylpyrrolidone (PVP) [6, 7], HPMC , ethylcellulose  and polyethylene glycol (PEG) [8, 9] are common polymeric carriers in such systems . The mechanisms underpinning the observed improvements in dissolution rate are not fully understood and rely on an understanding of the dissolution behavior of both components of the solid dispersion . In the present work, the physicochemical characteristics of active pharmaceutical substances and excipients including particle size, flow rate and solubility during manufacturing process dictate the quality of the products. Thus, ibuprofen solid dispersions were prepared by solvent and fusion-solvent methods using PEG 6000, PVP, eudragit RS PO and RL PO and also HPMC as carriers to improve physic-ochemical characteristics of ibuprofen. Ibuprofen was from Shasum, India; PEG 6000, Tween 80 and sodium lauryl sulfate were obtained from Merck, Germany; PVP was purchased from Hopkin and Williams, England; eudrgit RS PO and eudragit RL PO was from Rohm, Germany; HPMC was from Dow Chemical, England. All other reagents were of analytical grade from local markets. Ibuprofen (0.45 g) was dissolved in 50 ml of methanol and then 0.4 ml of phenol-phthalein solution was added to it. Titration was carried out with sodium hydroxide solution 0.1 M until red color was produced. A similar solution (blank) without ibuprofen was made and the required amount of sodium hydroxide solution was determined . This test was repeated three times and the mean of the results of 3 determinations was used for ibuprofen purity. A modification method of solibility determination was used to determine the solubility of diffrent ibuprofen solid dispersions . Weighed amounts of ibuprofen (pure drug), solid dispersions, and physical mixture, each sample equivalent to 0.5 g of ibuprofen, were separately introduced into 15 ml stoppered conical flasks containing 5 ml of phosphate buffer solution (pH 7.2). The sealed flasks were agitated on a rotary shaker for 72 h at 37 °C and equilibrated for 2 h. The supernatant solution was filtered through 0.45 μm membrane filter, and the filtrate was suitably diluted and analyzed on a UV spectrophotometer at 222 nm. Determinations were carried out in triplicate. Physical mixtures of ibuprofen and polymers (PEG 6000, PVP, eudragit RS PO, euragit RL PO and HPMC) in powder form were mixed and passed through sieve mesh no. 35. The physical mixtures were prepared in the following ratios: Ibuprofen: PEG 6000 in the ratios of 1:0.5; 1:1; 1:1.5 and 1:2. Ibuprofen: PVP in the ratios of 1:1 and 1:2. Ibuprofen: eudragit RS PO or eudragit RL PO, in the ratios of 1:0.5; 1:1 and 1:2. Ibuprofen: HPMC in the ratios of 1:0.2 and 1:1. Solid dispersions of ibuprofen and PEG were prepared by fusion-solvent method. The required amount of ibuprofen was dissolved in methanol. PEG 6000 was melted at 50-60 °C and added to the ibuprofen solution and mixed thoroughly . Other solid dispersions containing HPMC, either kinds of Eudragit or PVP were prepared by solvent method. The obtained mixtures were kept at 50-60 °C for 72 h and then the solutions were cooled at the room temperature to form solid . The prepared solid dispersions were milled to pass through sieve mesh no. 35. Ibuprofen: PEG 6000 in the ratios of 1:0.5; 1:1; 1:1.5 and 1:2. Ibuprofen: PVP in the ratios of 1:1 and 1:2. Ibuprofen: eudragit RS PO or eudragit RL PO, in the ratios of 1:1 and 1:2. Eudragit RL PO has a higher water permeability and swelling characteristics than eudragit RS PO, because it contains a higher ratio of quaternary ammonium groups . So, it was chosen for more investigation by using surfactants such as tween 80 or SLS to prepare solid dispersion. These kinds of solid dispersions were consisted of drug:polymer and surfactants. Only solid dispersions containing constant ratio of 1:1 eudragit RL PO: ibuprofen and different amounts of tween 80 (2%) or SLS (0.5 and 1%) were prepared and evaluated. All prepared powders (physical mixtures and solid dispersions) were mixed with 1% magnesium stearate as lubricant. Flow properties of powders are important parameters in mixing and passing through hoper, especially during tabletting and capsule filling . Therefore, for investigating prepared physical mixtures and solid dispersions, their flow property, angles of repose and compressibility's were determined and compared. Flowability measurments of powders were conducted by Erweka apparatus model GT. The outlet funnel and nozzle of 15 mm were used in all tests. The time required to empty the complete sample from the hoper was measured. The measured value was normalized to 100 g and was corresponding to the flowability . The test was repeated three times and the mean data was used as flowability value. The volume flow rate were measured as the same, using 100 ml of the powders. Where D is the diameter of a conical bed of the powder, and h is the powder bed height. Approximately 15 g of powder was poured through a stainless steel funnel from a height of 6 centimeter onto a level bench top. The angle that the side of the conical heap made with the horizontal plane was recorded as the angle of repose. Lower angle of repose values represented better flow . Table 1. Saturated solubility of ibuprofen in different ratios of physical mixtures and solid dispersions. * The formulation was not made in this ratio. Flat-faced tablets, 12.7 mm diameter, were directly compressed on a Korch single punch tableting machine. Compaction was accomplished by direct compression of blends (physical mixtures and solid dispersions) containing equivalent to 300 mg ibuprofen. The hardness of the tablet was adjusted at 6-7 Kg. All the tests such as weight variation, content uniformity, hardness, friability, disintegration were carried out on matrices, but only dissolution test is reported. Dissolution was determined by dissolution tester (Erweka type DT 800, Germany) and the USP XXII (apparatus II, paddle method). Dissolution studies was used at a rotation speed of 50 rpm, in 900 ml phosphate buffer (pH 7.2) maintained at 37 °C . Samples of 5 mL were taken at 5, 15, 30, 45 and 60 min. and then one hour intervals. Immediately after taking samples, equal volumes of fresh dissolution medium were replaced to maintain a constant volume for drug dissolution. The concentration of ibuprofen was determined using UV spectroscopy at 222 nm. Dissolution studies were performed in triplicate for each batch of tablets. Table 2. Angles of repose and compressibility determination from physical mixtures and solid dispersions containing ibuprofen. * Due to the difficulty to pass through funnel, omitted from investigation. In order to investigate the mode of drug release from matrices, the data corresponding to 5 up to 80% release were fitted to Equation 3 . Where Q is the percentage of drug released at time t, K is dissolution rate constant and "n" is the release exponent. The value of "n" indicates the release mechanism. For instance n=0.5 shows square root of time kinetics and n=1.0 shows zero-order release . Figure 1. Rlease profile from matrice prepared by solid dispersion containing different ratios of ibuprofen:PEG. Assay of ibuprofen powder used in this study was in the range of 101.5 to 104.8% purity. The maximum absorption of ibuprofen was obtained at 222 nm and maximum saturated solubility of ibuprofen in phosphate buffer solution (pH 7.2) was determined as 3.74 E 0.14 mg/ml. Ghosh et al. reported that the solubility of ibuprofen is pH dependent. They gave a solubility of ibuprofen of 0.075 g/l at pH 2.0, 0.35 g/l at pH 4 and 2.325 g/l at pH 6. The obtained results confirm the report of Ghosh et al. .
Table 1 shows the saturated solubility of ibuprofen from different solid dispersions. Solubility studies showed that the solubility of ibuprofen in PEG, increased up to 50% in comparison with pure ibuprofen (p < 0.05). Similar findings was reported by Khan et al. , who claimed this phenomenon was due to water solubility of PEG. The solubility of ibuprofen decreased in the solid dispersions using eudragit RS PO and eudragit RL PO (Table 1). The reduced saturated solubility of solid dispersions containing eudragit is due to ion interaction between ibuprofen and eudragit . Heun et al. reported that hydrophobic interaction energies for the eudragit RL fragments to all drugs were higher than that for the eudragit RS fragments, because of the double number of positively charged quaternary ammonium groups compared to eduragit RL. HPMC did not significantly affect on phase solubility of ibuprofen, because HPMC solid dispersions produced a gel which reduced diffusion of ibuprofen from particles . Figure 2. Release profile from matrice prepared by solid dispersion containing 1:1 ibuprofen: eudragit RL PO with 0.5 and 1% SLS or 2% tween 80 in comparison with matrices without surfactant. Flowability studies of powders containing PEG, showed that solid dispersion technique slightly improved flow properties compared with the physical mixtures. Physical mixtures and solid dispersions containing PVP produce a mass with a high viscosity which makes it impossible to continue investigation. Also, after 2 months, due to plastic characteristics, milling and size reduction was not possible, therefore, it omitted from investigation. The low flowability of solid dispersions containing PVP, is due to high ability to absorb water and its plasticity characteristics . Similar finding was observed for ibuprofen:eudragit RL PO in the ratio of 1:2. Figure 3. Rlease profile from matrice prepared by solid dispersion containing 1:1 of ibuprofen : PEG or eudragit RL PO, eudragit RS PO, HPMC and 1:1.5 of ibuprofen: PEG (best formulation). Determination of angles of repose and compressibility studies are shown in the Table 2, in which, it is seen that preparation of solid dispersion in the ratios of 1:1 and 1:1.5 of ibuprofen:PEG, promotes physiochemical properties compared with physical mixture (p < 0.05). The results of dissolution tests from tablets containing solid dispersions of PEG, are shown in Figure 1. It is seen that as the ratio of PEG from 0.5 to 2 increased, the release rate increased. Similar finding is observed for their physical mixture. The release kinetics for the these formulations was zero order with the value of "n" between 0.893 -1.200 (Table 3). HPMC (due to gel formation) and eudragit (due to ionic interaction) caused slow release of ibuprofen. The release kinetics was observed as Higuchi model with the "n" value of around 0.5 (Table 3). Similar finding was reported by Sadeghi et al. , that solid dispersion systems of acetaminophen and eudragits resulted in decreasing drug release rate. Addition of surfactants such as Tween 80 and SLS in the solid dispersions containing eudragit, caused decrease in release of ibuprofen (Figure 2). It is seen that the formulation without surfactant released about 18% of drug in 4 h, whereas, formulations containing SLS or Tween released only 8% of drug during 8 h. Ghosh et al. using ibuprofen, starch, PVP and SLS, reported that the release rate of drug decreased as the SLS concentration increased from 0.01 to 0.05%. Figure 3 shows the release pattern from different formulations containing ibuprofen: PEG, eudragit RS PO , eudragit RL PO or HPMC in the ratio of 1:1. It is seen that matrices prepared by 1:1 ibuprofen:HPMC had the lowest release rate. In this ratio only 10% of the drug released after 6 h, whereas formulation containing 1:1.5 of ibuprofen:PEG had a constant release rate of ibuprofen about 50 mg per hour that was found suitable for sustained release of the drug . Table 3. Release parameters from matrices containing ibuprofen and different ratios of PEG, eduragit and HPMC. Ibuprofen solid dispersions were prepared using PEG, PVP, eudragit RS PO, eudragit RL PO and HPMC as carriers to improve physic-ochemical characteristics of ibuprofen. Solid dispersion technique found to be effective in increasing the aqueous solubility of ibuprofen. In vitro dissolution studies showed that inthe dispersion systems containing eudragit or HPMC, dissolution of ibuprofen was retarded, which attributed to ionic interaction and gel forming respectively. But solid dispersion containing PEG, as a carrier, gave faster dissolution rates than the physical mixtures. Finally, solid dispersion of ibuprofen:PEG 6000 prepared in 1:1.5 ratio showed excellent physicochemical charac-teristics and was found to be described by the zero order kinetic, and was selected as the best formulation in this study. Habib MJ. Historical background of solid dispersions. In: Habib MJ, (editor). Pharmaceutical solid sispersion technology,Lancaster: Technomic, 2001, pp: 1-6. Chowdary KPR, Srinivas L. Physical stability and dissolution rate of ibuprofen suspension formulated employing its solid dispersion. Indian J Pharm Sci 2000; 62: 253-6. Khan GM, Jiabi Z. Preparation, characterization and dissolution studies of ibuprofen solid dispersion using polyethylene glycol, talc and PEG-talk as dispersion carriers. Drug Dev Ind Pharm 1998; 24: 455-62. Dehghan MHG, Jafar M. Improving dissolution of Meloxicam using solid dispersions. Iranian J Pharm Res 2006; 4: 231-8. Abu TMS. Solid dispersion of poorly water soluble drugs: Early promises, subsequent problems and recent breakthroughs. J Pharm Sci 1999; 88: 1058-66. Ghebremeskel AN, Vemavarapu C, Lodaya M. Use of surfactants as plasticizers in preparing solid dispersions of poorly soluble API: Selection of polymer-surfactant combinations using solubility parameters and testing the processability. Int J Pharm 2007; 328: 119-29. Ohara T, Kitamura S, Kitagawa T, Terada K. Dissolution mechanism of poorly water-soluble drug from extended release solid dispersion system with ethylcellulose and hydroxypropyl-methylcellulose. Int J Pharm 2005; 302: 95-102. Sadeghi F, Afrasiabi Garekani H, Ghodsi A. Evaluation of solid dispersion systems of acetaminophen and ethyl cellulose, eudragit RS or RL and the effect of solvent used in preparation of these systems on characteristic of matrices. Pharm Sci 2006; 1: 47-54. Himasankar K, Murali Mohan Babu GV, Krishna-babu PSS, Prasad DS, Rao LN, Raman Murthy KV. Studies of the solid dispersion system of glizizide. Indian J Pharm Sci 2002; 64: 433-9. Khan GM, Bi Zhu J. Ibuprofen release kinetics from controlled-release tablets granulated with aqueous polymeric dispersion of ethylcellulose II: Influence of several parameters and coexcipients. J Control Release 1998; 56: 127-34. British pharmacopeia. Vol. 1. London: The stationery Office, 2004; pp. 1009-10. Dabbagh MA, Ford, JL, Rubinstein MH, Hogan JE, Rajabi-Siahboomi AR. Release of propranolol hydrochloride from matrix tablet containing sodium carboxymethylcellusoe and hydrox-ypropylmethylcellulose. Pharm Dev Techno 1999; 3: 313-24. Habib MJ, Venkataram S, Hussain MD. Fundamentals of solid dispersions, In: Pharmaceutical solid dispersion technology,Lancaster: Technomic, 2001; pp. 16-26. Aiache JM, Beyssac E. Powders as dosage forms, In: Swaibrick J, (editor). Encyclopedia of pharmaceutical technology. New York: MarcelDeker, 2002; pp. 2265-77. Erweka, Instruction manual, granulate flow Tester, type GT, 2001. Marshall K. Compression and consolidation of powdered solids. In: Lachman L, (editor). The theory and practice of industrial pharmacy.Philadelphia: Lea and Febiger, 1986; pp. 67-71. Heun G, Lambov N, Groning R. Experimental and molecular modeling studies on interactions between drugs and eudragit RL/RS resins in aqueous environment. Pharmacutica Acta Helvetica 1998; 73: 57-62. Crowder TM, Hickey AJ. The physics of powder flow applied to pharmaceutical solid. Pharm Technol, 2000; 24: 50-8. Wells J. Pharmaceutical preformulation: The physicochemical properties of drug substances. In: Aulton ME (editor). Pharmaceutics, the science of dosage forms, 2nd edition. London: ChurchillLivingstone: 2002; pp. 113-38. Ghosh LK, Ghosh NC, Chatterjee M, Gupta BK. Product development studies on the tablet formulation of ibuprofen to improve bioavail-ability. Drug Dev Ind Pharm 1998; 24: 473-7. Ritschel WA, Kearns GL. Handbook of basic pharmacokinetics. 5thedition. Washington:American Pharmaceutical Association. 1999; p. 491.